Pope Francis arrives at the Central Mosque in the PK5 neighborhood to meet with members of the Muslim community in Bangui, Nov. 30, 2015..
Pope Francis wrapped up his visit to the Central African Republic on Monday with a visit to a mosque in a particularly tense part of the capital. 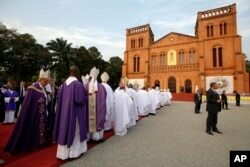 The pontiff brought his message of peace and reconciliation to a mosque in Bangui’s PK5 neighborhood. It was perhaps the most treacherous part of his 24-hour stay in the C.A.R.’s capital. PK5 was once home to tens of thousands of Muslims. But the area has been the scene of multiple clashes between Muslim and Christian militias, and the majority of its residents have fled to other cities or IDP camps. Despite security concerns, Pope Francis arrived at the mosque in his open-sided popemobile, flanked by guards and United Nations peacekeepers. Pope Francis arrives to lead a mass at the Bangui stadium, Central African Republic, Nov. 30, 2015. Addressing an audience inside, he called for solidarity between Muslims and Christians. Ali Aichatou is one of hundreds of people who live in tents on the grounds of the mosque. She fled there during the peak of the inter-communal violence in early 2014. She says if the pope goes back and peace doesn’t come, she expects the government to continue the work because she says they’re trapped in their neighborhood. And if there’s still no peace, she says she’ll just have to turn to God. 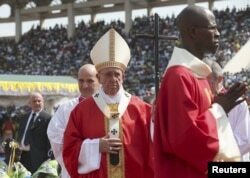 Later that day, Francis celebrated mass in Bangui’s stadium before departing for the Vatican. Pope Francis arrives to open the holy door of the Bangui cathedral, Central African Republic, Sunday, Nov. 29, 2015. The question now is whether his visit helped to ease tensions. The conflict in the C.A.R., dating back to early 2013, has killed thousands of people and at its peak displaced over a million. Nancelle De Lourdes is a Christian who attended the pope’s stadium mass. She says she’s ready for Muslims and Christians to live alongside each other once again. It’ll be hard, she says, but we are all God’s creations, and we’re ready for reconciliation. The next test of peace in the C.A.R. will come December 13, when the country holds a constitutional referendum ahead of a presidential election planned for two weeks later.